Mesker Door and Design Hardware held their annual sales meeting during the week of the DHI convention in Las Vegas. 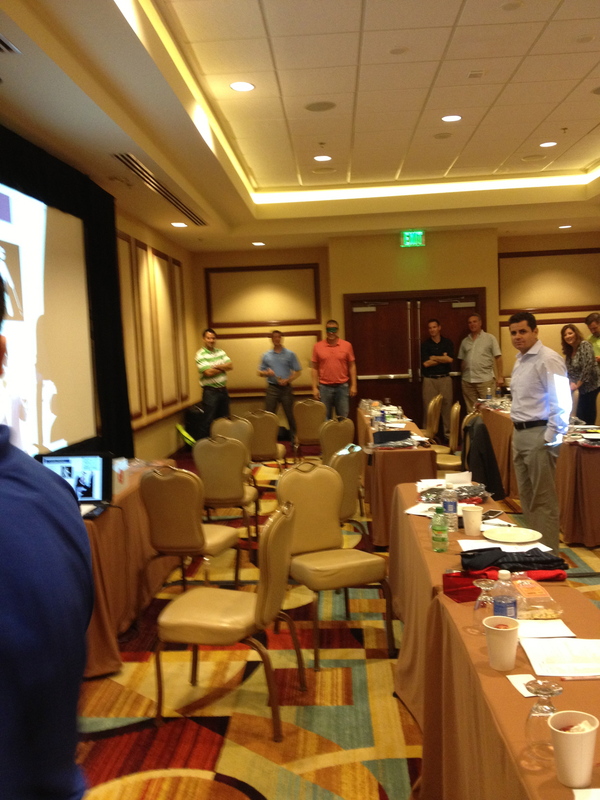 A special thank you to our national sales managers, Nick McCarty and Joe Lopez for organizing such an energizing sales meeting with team building exercises. Over the past several decades, management theory has evolved from the promotion of competitive work environments to the development of cooperative ones. As part of this evolution, businesses, especially small businesses, have put an ever-increasing emphasis on team building. Team building activities, whether they are five-minute games or week-long retreats, teach essential collaborative skills while helping employees develop trust in each other and each other’s abilities. The premise is everyone working toward the same goal and each team member’s contribution is equally respected. Whether you are a business owner, manager or an employee you must admit that sounds like an attractive proposition. Being a member of a team means you are not in this alone. One exercise we participated in, often referred to as “Mine Field”, was designed to improve communication and trust. The challenge was for a team member to be blind-folded and guided through a set of obstacles by another team member by simply listening to their verbal instructions. We used staggered chairs as the “mines” in our field as we were in a hotel conference room. I will share with you that one group knocked over one of the banquet tables and sent papers and water everywhere. Another team guided their blind-folded participant to walk straight and pick up and move anything in your way. So, I do suggest setting up some parameters and rules before executing this particular team building exercise! It was effective in uniting our efforts toward a common goal, and of course a lot of fun. I liked this exercise so much I would like to expand this idea and move it to the factory. Include both the outside & inside sales staff along with an employee from each department including the production line, shipping, credit department, etc. What a team that would make. If you are interested in learning more about team building activities or need some suggestions, check out Mind Tools.